Join Barbara Slaine and Andrea Candee as they guide you. A Liquid Feast is a feast not a fast, as deprivation is not necessary for the body to detox and heal. Learn how acidity causes inflammation, pain and many other symptoms, and how you can naturally relieve detox discomforts that may arise as you cleanse. Using alkaline water, cleansing greens, healthy oils and mineral salts, you will be eating delicious foods while detoxing, increasing your energy levels and decreasing inflammatory symptoms. Join us and experience how easy it can be and how wonderful it feels to be in balance. 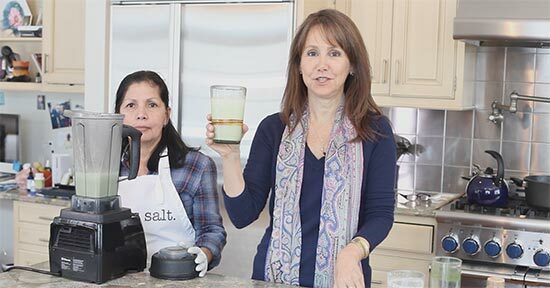 We provide step-by-step recipes for your Liquid Feast foods for transitioning into eating the alkaline way. With the Liquid Feast Manual and video you have everything you need to begin transforming your life! We have made this affordable for you…The Video and Liquid Feast PDF Download is $95.00. The Alkavision Greens, Alkazone pH Drops, Bio Nativus Spray Salt and more are in our store. Click HERE to view the Liquid Feast “Table of Contents”. Learn more about the high-alkaline diet and cleanse HERE. The Liphe Balance Center, LLC and its affiliates are not physicians and the ideas and healing procedures and suggestions in this Liquid Feast Alkaline Cleanse Guide are not intended as a substitute for the medical advice of a trained health professional. Consulting a physician before adopting the suggestions in the LIquid Feast is recommended as well as about any condition that may require diagnosis or medical attention. While natural remedies and healing techniques are generally safe it is not possible to predict an individual’s reaction to a particular treatment or therapy. The authors of this guide, The Liphe Balance Center LLC and its affiliates disclaim any liability arising directly or indirectly from the use of the LIquid Feast Alkaline Cleanse Guide, or of any products, companies, or therapies mentioned herein.